Because my family moved around quite a bit when I was a child, some of my early memories are quite confused. My father had a Wanderlust which he probably got from his mother’s family. Her father was a Scottish sailor who was supposed to have sailed all around the world but didn’t, and all her brothers were sailors too. My father went to sea a few times and lived in Africa, New Zealand and different parts of England at different stages as well as having lived in several places as a child. By the time I was 20, he was living in Devon and I was a student in Yorkshire so I travelled down by train a few times a year to visit him. It was an eight hour journey (now less than five) which I loved, there was so much to see and the scenery was quite varied. Like his mother, he was a good story-teller (but less inclined to embroider his stories — he didn’t need to, they were already so interesting) and there was always plenty to talk about, but, unfortunately, we never thought of talking about family history. Talking about childhood memories, he said that young children have very visual memories because they are not able to put them into words. I began to describe some of my earliest memories, all of them visual including being taken for a walk in my buggy (or the equivalent) when we were living in Greenore on someone’s birthday by several older children when I was about two. I described a seawall, rows of small houses and looking across the mudflats of the estuary on a dull day. “No” he said. “definitely not Greenore. You would have seen the mountains on both sides of the shore.” I was puzzled. I had lots of other very clear and definite memories so where was this one? A few days later, I was back on the train, this time to Liverpool for my flight back to Cork. It was another long journey, maybe not eight hours but near enough, and there were several changes unlike the train down from Leeds. With about an hour to go, we came to a halt in the middle of nowhere. There was an announcement: Due to a derailment at Crewe all trains would be delayed for 30 minutes or so. I settled back, I had several hours to spare so I didn’t have to worry. Looking out the window, I was electrified. There was the exact scene I had tried to describe to my father — the wide curving river estuary with the mudflats, the whole landscape so grey and flat. We had both forgotten that after we had left Greenore when I was 2 or 3 and moved to England first, we had stayed in Runcorn for a few months. We later moved closer to Manchester, about 30 miles away, but with relations in Liverpool, we were always back and forth. But apart from my memory of being brought for a walk by the older children, my only other memory of Runcorn is the Transporter Bridge. 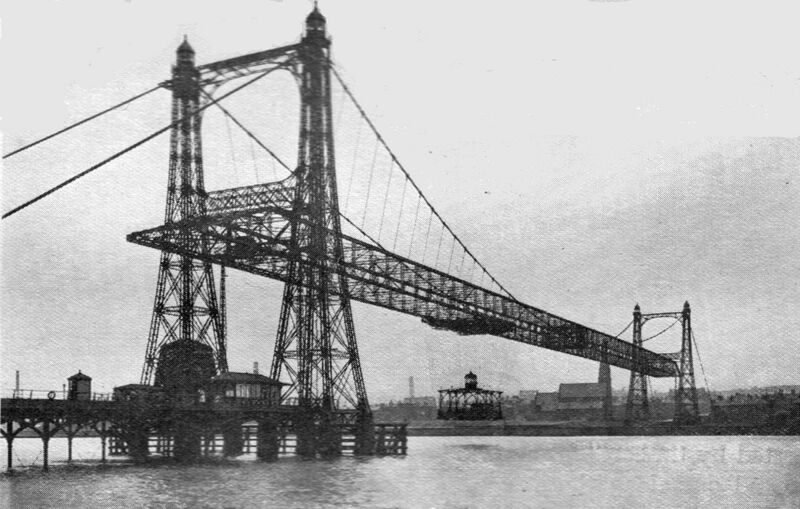 The Transporter Bridge was the first of only four built in Britain. Less than 30 were ever built anywhere, the first being in Bilbao in 1893. Crossing the busy Manchester Ship Canal between Liverpool and Manchester and the river Mersey, it had to be high enough to clear the tops of the ships which, it was thought, would make a normal bridge too expensive. Instead, a transporter car was suspended from a moving trolley between two towers (55 metres/180 feet high) and shunted on cables from one side to the other, clearing high water by 3.7 metres/ (12 feet). It did not operate after 11.30 at night or in high winds, and was timed to suit river traffic. It is easy to think of Lancashire as the Industrial North but it has a history of farming going back before medieval times, establishing market gardens in the 19th century and being a prime grass producer. Canals such as the Leeds & Liverpool Canal enabled the transportation of fertiliser, manure and grain. So it should have been no surprise to find that, when completed in 1905, the transporter could carry 4 two-horse farm wagons and 300 passengers. Before that, the only way across the river and canal was by ferry, climbing walls on both sides of the canal, or by train. A road bridge was needed. An Act of Parliament had to be obtained in 1900 to get approval for the bridge. This Act also allowed for the formal ending of the ferry. It was designed by John Webster, a civil engineer who specialised in designing bridges and was responsible for the reconstruction of the Conway Suspension Bridge as well as work on the Menai Bridge and many others. The transporter never paid its way and as early as 1911, the Widnes & Runcorn Bridge Company sold it to Widnes Corporation. But times changed and by the time it closed, the transporter had carried 280,000 cars, 145,000 commercial vehicles and over 2 million foot passengers. Although the journey took less than 3 minutes, queues and severe traffic jams built up on both sides. The old transporter bridge closed in 1961 (we had returned to Ireland in 1958), just one day after a new bridge, the Silver Jubilee Bridge, opened. All that remains now is the red-brick power-house at Widnes. When I eventually managed to get to Greenore many years later, I could see the difference between the two scenes. In many ways there was no comparison, and yet there were the basic elements of my memory — the seawall and row of small terraced houses. As a frustrated engineer (not allowed to study engineering) my father must have loved that bridge. I know I did.